"Sail Away" Sleeps 4. Lovely one bedroom condo-tel with 2 queen size beds and double vanity. Very nicely refurbished with attractive beach theme. Includes microwave, small refrigerator, coffee maker and 40 inch flat screen TV. Conveniently located on the ground floor with quick and easy access for loading and unloading. This unit is handicap friendly with handrails in the shower/tub. 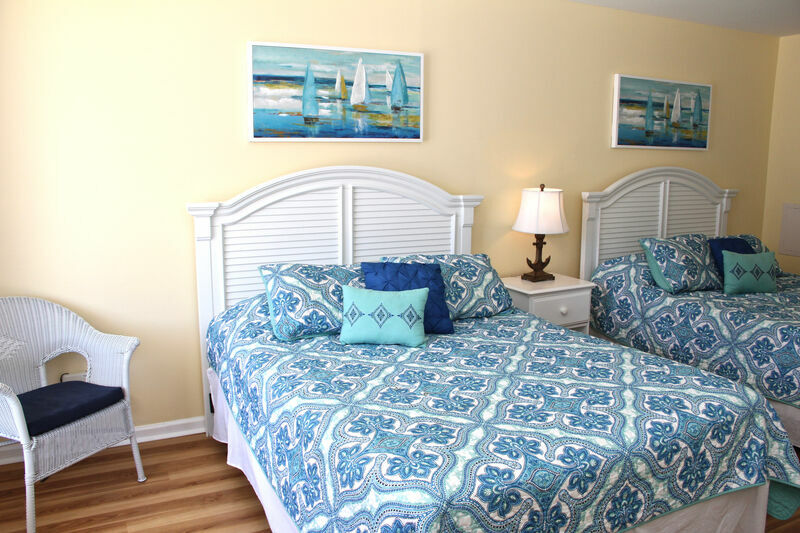 Causeway Inn is centrally located on beautiful Ocean Isle Beach just one block from the ocean, fishing pier, oceanfront public parking and easy walking distance to local restaurants and activities. On site swimming pool and sundeck for your enjoyment. May be rented on a nightly basis. Free Wireless Internet!! Non-smoking, no pets permitted. nice place to stay . will stay there again!! I would recomend the Causeway!! Easy check in with Sloane Realty. Sloane Realty was easy to work with. We enjoyed our stay at the Causeway! !